During my high school and college years, the biggest rock bands played at the Birmingham Jefferson Civic Center Arena. The BJCC arena was the largest indoor concert space in the state of Alabama. I saw bands like the Eagles, Aerosmith, Bad Company (twice), Crosby, Stills and Nash, and Kiss (four times). A sold-out show meant an attendance of about 20,000 people. Yesterday, my blog had a record day. I got the coveted “Your stats are booming” alert from WordPress three times. See the stats graph above. On a good day, I’ll normally get about 1,000 page views. The total yesterday: 27,523. Thats way better than a sold out show at the BJCC arena (maybe this is a bad analogy, but I got a lot of eyes on my blog yesterday). 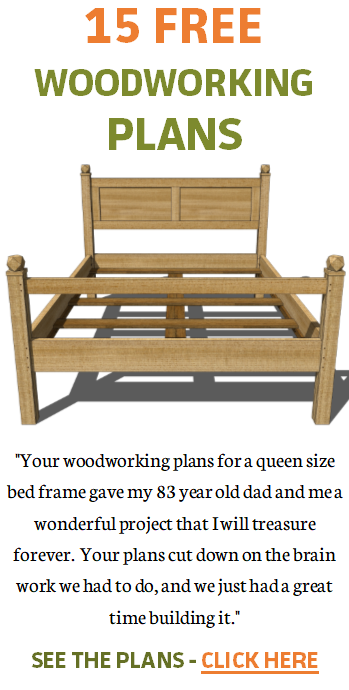 SketchUp featured one of my woodworking plans in their recent email newsletter; best of the web section. See the red arrow below. I began this blog in 2009. One thing I have learned is that to get noticed in the crowded blogosphere, you need the help of others. Yesterday, SketchUp was a ginormous help. Already today, I have an additional 6,238 page views and it is not yet 7:30 am. So my stats will continue to boom today. Thank you SketchUp! that’s awesome Jeff!! It’s cool to see stats when the numbers are high like that!!! Thanks Michael. Yep, pretty sweet. SketchUp is the help, but your work is what creates interest, keep it up! Just got into woodworking and found this through that email. I’ve read through nearly all of you posts, and it’s awesome. Great craftsmanship and a great blog. Thanks Ben. I appreciate your kind words and support. That’s cuz you make awesome drawings bro! You have helped my drawings get better so thanks Jeff and congrats! You put a lot into those drawings and I am glad to see you get the recognition. I do put a lot into my SketchUp models, but it is a challenge and fun as well. Thanks for the comment. Good for you Jeff. I appreciate all you do and love to follow your projects! I appreciate your kind words David. I will keep it up and you keep it up too. You will get there! I feel your joy. I am trying to increase my blog readership. ( not sure why but it keeps me in the shop and keeps me thinking. I got a big hit one day from Gripper. Nice ! I read a Chris Schwarz blog about blogging. The most important thing is consistency. So I am trying to be in the shop at least 3 -4 times a week. And Create lots blogs from those sessions. I am learning how to be efficient with the photography etc. I need to get a subscription list working on my blog. Interesingly. My tactic is to cross post the blog on Google+ and two large Facebook woodworking groups. Also I post on Woodnet,net because I just like that envirnoment. I get the biggest hits from FB and Woodnet. Thank you Bartee. I try to post once a week, however I usually share a post on twitter, and two groups on Google+. I have an account at Lumberjocks which is a big community, but I dislike pushing my posts on other people. But it is good for stats. I have a goal of getting to 1,000 page views regularly before I move to a self hosted site where I can put a small amount of advertising on my site and generate at least a little income for software and such.